The positive correlation illustrated below suggests the “surge” in cross-border shipments during the standstill period to date is largely demand-driven. The chart plots B.C. 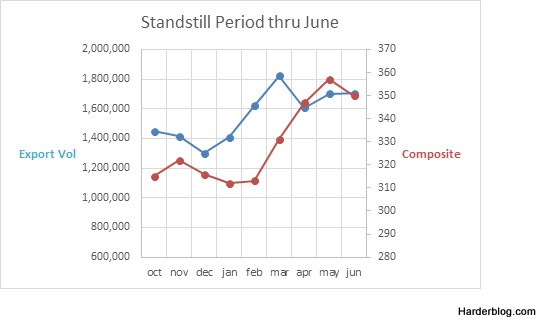 softwood exports to the U.S. per BCStats vs. the Framing Lumber Composite Price by month per Random Lengths (most recent data for softwood shipments is June; the Composite Price had climbed to $369 by the end of last week). This entry was posted in Industry and tagged export, lumber market, SLA, Softwood, US housing market. Bookmark the permalink.